Matiatia Valley, Sculpture on the Gulf, Waiheke Island, Auckland. Collection of Telstra Clear Pacific Events Centre, Manukau, Auckland. The sculpture was created for the inaugural ‘Sculpture on the Gulf’ exhibition on Waiheke Island, Auckland, where it was suspended above a valley in Matiatia Bay. Visitors were able to view the work from the track above, before moving around the head of the valley and walking beneath the frond, the detailed shadows of which were cast onto the valley floor. Traditionally the fern frond is a symbol of peace and welcome. Matiatia Frond embodies themes of frond feather and fishbone, and acknowledges elements of land, sea and air. The form alludes to the structure of vessels, with keel and ribs enhanced by layers of red acrylic pigment referencing the colour of life. Both upturned hull form and the layering of fronds are associated with shelter and nurturing. Matiatia Frond won the People's Choice Award 2003. 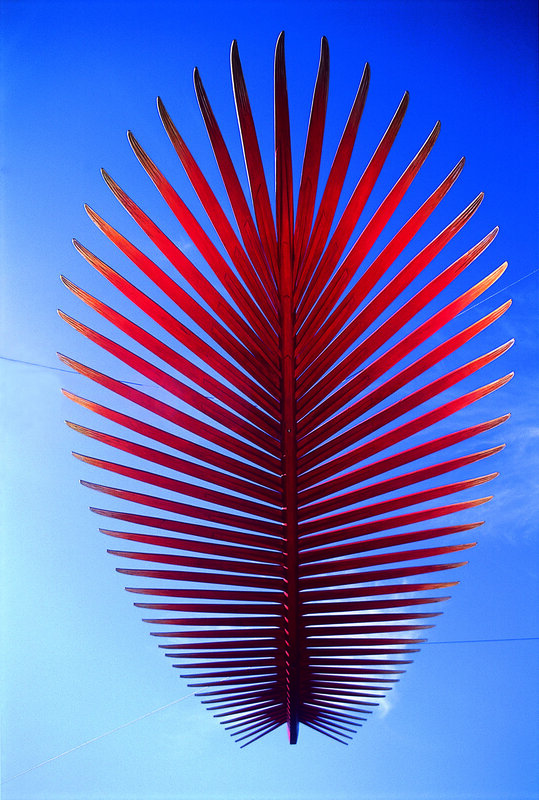 In 2005, the six and half metre long Matiatia Frond was purchased for the foyer of Telstra Clear Pacific Events Centre in Manakau, along with two commissioned companion sculptures Feather and Fern. Dimensions: Height 6500mm x Width 2800mm x Depth 800mm. Materials: Laminated macrocarpa and acrylic paints.